Max is another author that I've had the privilege to read because of Chuck Palahniuk. The first paragraph of Syrup is one of my favorite openings to a book of all time, I won't write it here, but I hope that makes you go out and buy it, it's worth it! 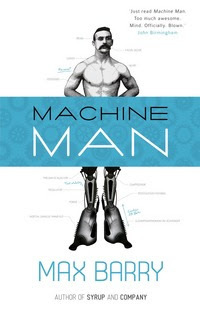 His new book, Machine Man, just came out, and it is epic, check out his interview, below! A literary novel about a woman's existential quest for meaning, including a heart-rending section set on a farm where her childhood pets are sent to slaughter. 2. Your new book, Machine Man, just came out, what was your process writing this one? I know it was very different than your other books. I wrote it live, posting one page per day to my website, where people could post comments. It took nine months and I nearly lost my mind. 3. I loved your first three books, is Machine Man going in a different direction, or should your readers expect the same, Max Barry? Machine Man is different. I kind of underestimated how different. It's only seeing reviews saying WHAT IS THIS IT'S NOT LIGHT-HEARTED CORPORATE SATIRE AT ALL that I've started thinking, yeah, I guess that is pretty different. 4. Syrup is being turned into a movie, how insane was it finding out that it was really going to happen? When is it expected to hit theaters? That's two questions. This thing, it looks like twenty questions, but it's really thirty. I don't believe for a second anyone cares about me enough to read my answers to thirty questions. I'm going to start brutally summarizing. It was so insane I didn't believe it until they started filming, and mid-2012. 5. You’re not doing the normal book tour, can you tell us a little bit about your skype tour? How is it going? People have been surprisingly normal. I kind of assumed it would draw out the crazies. But everyone's been really nice. It's been fun. 6. How did you go about selling Machine Man? Especially, with the way you wrote it. I got about two months in and thought, "If I'm going to spend nine months writing this thing, I should earn something from it." So I threw up a PayPal thing. 7. Your book trailer was brilliant, have you heard a lot of responses to it? Are you going to continue doing them? They're kind of required, now. I don't think they can be avoided. But I aim to make them as little about the book as possible. 8. I read in another interview that you have two books in progress, do you have any updates about them? Sorry, no. I don't talk about books until someone agrees to publish them, after a humiliating experience in 2000. 9. Where do you see literature going? Is it all going to e-readers, online, etc.? It's definitely going to e-readers. I think the novel is safe. But paper is in big trouble. 10. You wrote a novel in college and multiple others after that were never published, what ever happened to them? Any chances of resurrection? Wow, I'm not that cruel. You don't want to read my college novel. The other books... well, some are more salvageable than others. 11. You have two little girls now, are they taking a lot of your time away from writing or just inspiring you to write more? Both. They do take enormous amounts of time, which is as it should be. But they are completely inspiring. 12. Are you in any writer’s workshops, currently? I remember you used to be a part of an online workshop, yes? I used to, yes, but now I just harass writer friends. Workshops are great, but I can't use them now or my agent freaks out about leaked manuscripts. 13. What can you tell us about Eight Weeks in Aquitaine? Is it still a viable option? Maybe under a pseudonym? Yes! I still love that book. It suffers from a marketing problem, in that it's basically goofy, and I am supposed to be known for smart satire. I think if I lower my reputation enough, I get to publish it. 14. I was just turned on to www.corporateoppression.com doing research for this interview, it’s awesome, have you seen a lot of hits on it? Wow, I forgot that site exists. I made it in 2005 or 06. I should probably update that. 15. You have Max’s Bookshelf on your page, which is awesome, are you reading anything now that you can’t put down? 16. Starting to blog so your readers don’t get bored is really nice of you; do you feel like authors today have a choice? Well, you can be ridiculously talented. I think if you're ridiculously talented, you get to just stay home and write. If you're a guy like me, it helps to promote yourself a little. 17. The reviews of Machine Man, so far, are extremely positive; do you think you’ll do another project like this? It depends on the idea. I really enjoyed writing the serial, but it doesn't suit every kind of story idea. It needs a simple, clear concept with a linear storyline. 18. With all of the specific company names you used in your first three published books, how have you not been sued? I'm not really sure. I just know I keep using real company names and they keep not suing. 19. I have to say, when someone comes over to my place and wants to talk about books, I show every one of them the first paragraph of Syrup, it’s just brilliant, how do you think the movie will transfer over to film? It's hard to know until I see it on screen, but I'm very excited by what I saw during filming. It won't be just like the book. I think an adaptation needs to find a cinematic way to express the book's heart, which I think these guys did. 20. Do you have any advice for aspiring writers, or just anything you’d like to send out into cyberspace, through a goat? My advice for writers is to nurture what makes you different. Being unique is the only reason anyone will want to read your words. But don't be INSANE. There's a line. And finally, don't forget to "like" Mourning Goats on Facebook and pick up Chewing the Page: The Mourning Goats Interviews on Amazon!